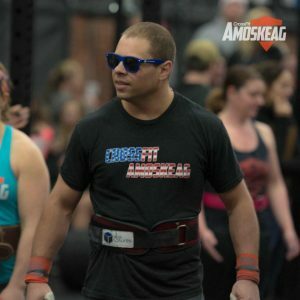 What is CrossFit Amoskeag to you? Over the past 2.5 years Crossfit Amoskeag has become a second home for me and my family. As a fitness professional going to the gym and living a fit and healthy lifestyle has never been a question. The question for me is where am I going to do it? I will start by saying that Crossfit caught my eye nearly a decade ago and when I finally got started 5 years ago I knew it was right for me. It checked every box I was looking for when it comes to a fitness regimen. First and foremost it works. As someone who has spent the past 20 years of my life exercising and eating healthy Crossfit has gotten me into the best shape of my life. Soon I will be able to say that because of Crossfit I am fitter at 40 than i was at 30 or even 20. So to repeat most importantly Crossfit works. The other things I love about crossfit is that i can be competitive if I want it to be, there are always fitness professionals teaching class, you are with like minded individuals all moving towards a common goal, and the #2 most important thing is that Crossfit is safe and its fun. Finally it helped motivate my wife to exercise after the birth of our first child and it is currently teaching my 2 children about exercise. Unfortunately not every crossfit gym is the same and many of the Crossfit gyms in the surrounding area are doing a poor job representing what Crossfit is. 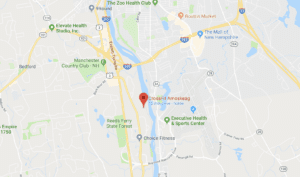 After spending time in one such inadequate gym I began looking for an upgrade, and after a diligent search I decided that Crossfit Amoskeag was the place. Now I can bore you with the facts about how much nicer the equipment is or how much more space is available, or even how cool the being screen TV’s we use to track our scores is, but there is only one reason I am a member of CFA…..the community. A single story will drive home how wonderful the community is. During my first week as a member I had brought my 2 year old son with me to the gym (yes having kids come with you is completely acceptable and there is even a room with a tv and couch for them to hang out in while I work out). During a particularly difficult workout I noticed my son and a women coming out of the bathroom and she motioned to me to continue to finish my workout. Mind you I had never met this women before. When the workout finished I walked over introduced myself and asked what had happened. The women explained that my son was requesting to go to the bathroom and that instead of disturbing me she asked him if she could help him. When he said yes she helped him do what he needed to do because she felt that it was more important for me to finish what I was doing. I thanked her profusely and she said something to the effect of “don’t worry about it we all take care of each other here.” I couldn’t believe it. At that moment I knew that this was the type of atmosphere and community I wanted to be a part of. Now I have four CFA memberships. My wife and I regularly attend class and other programs, and both my kids go to Crossfit Kids on the weekend. The facts are simple. 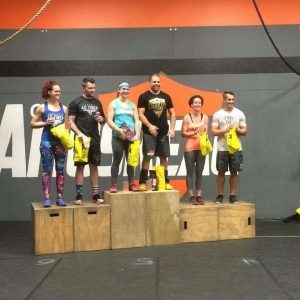 If you want to get fit, have fun doing it, and be part of a wonderfully supportive community than Crossfit Amoskeag is the place.